The Farrer group works in the inter-disciplinary field of Metals in Medicine, which involves Organic and Inorganic Chemistry, Engineering and Medicine. 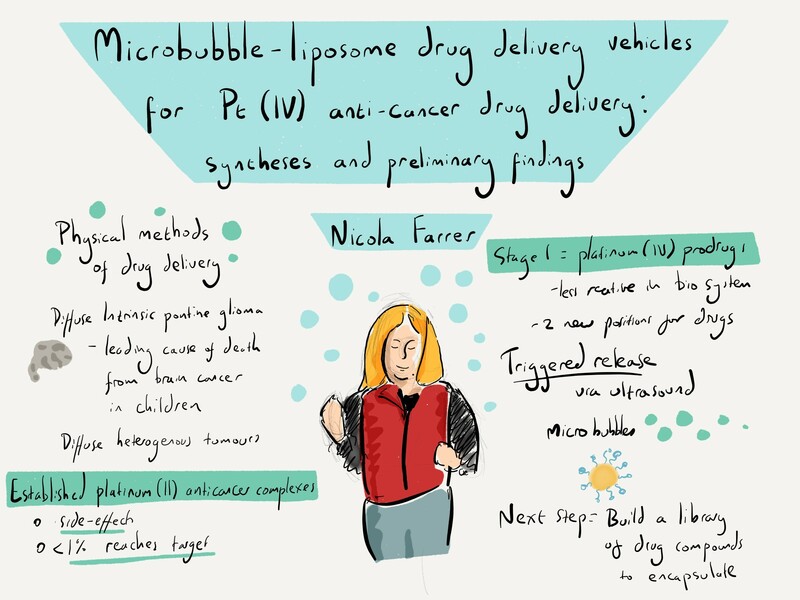 We are interested in developing new, metal-based anti-cancer complexes, and in using physical methods of drug delivery (ultrasound, light) to deliver drugs more accurately. We have a particular interest in delivery to the brain, and paedatric glioma (children's brain cancer). We talk to, and work with other researchers in many academic and industrial settings. Our labs are on the second floor of the Chemical Research Laboratory (CRL) building in Oxford. Please note that due to the high volume of emails received, we do not respond to obvious circular emails or non-specific enquiries. When emailing, please include your CV and a cover letter outlining your scientific training/career to date and detailing your specific interest in our research. Feb 2019 - Welcome to Marie Boulet, who joins us on a Masters placement from the University of Strasbourg. December 2018 - Congratulations to Louise for passing her viva! September 2018 - Welcome to two new Part II students Alice and Jack, and a new DPhil student Laura. July 2018- Well done Nia and Sam! Nia and Sam have both successfully completed their Part II projects in the group - best of luck to both of them for their next ventures! Nicky has been awarded a Fellowship worth £15,000 to spend on developing new drugs for treatment of DIPG (diffuse intrinsic pontine glioma). She was interviewed by BBC Radio Oxford, and a short article also appeared in the Oxford Mail on 26th May. Find out more out DIPG here and about the work already being done on DIPG by inspirational people like Michelle Monje's group (Michelle is a paediatric neuro-oncologist specialising in DIPG). May 2018 - we have joined the Children's Brain Tumour Drug Delivery Consortium. Following a productive meeting in London we're looking forward to establishing new collaborations in order to develop new treatments and delivery methods for paediatric brain tumours. Feb 2018 - Our latest publication "Platinum(IV) azido complexes undergo copper-free click reactions with alkynes" published in Dalton Transactions as an open-access Advance Article can be found here. This work is the first example of a click reaction with a platinum (IV) azide.